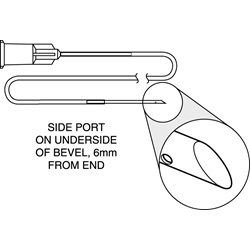 Disposable Chamber Maintainer cannulas range from 20 gauge to 27 gauge in size. 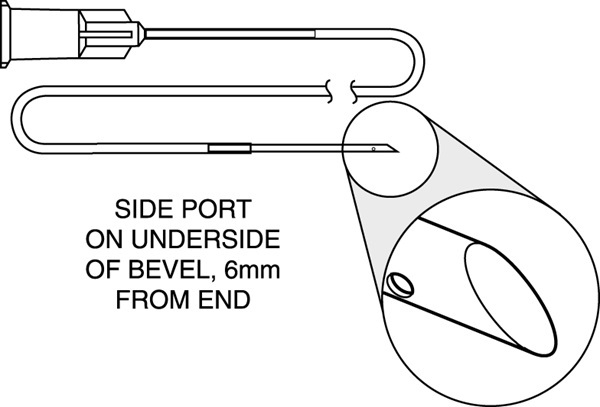 Each cannula has a straight shaft with a sharp, closed end tip with a 0.2mm or 0.3mm sideport. Comes with 6" silicone tubing and has an overall length of 22mm. Sold 10 per box. 20 gauge, 0.3mm sideport, 6" silicone tubing: ID - 0.75mm (0.030"), OD - 1.65mm (0.065"). 23 gauge, 0.3mm sideport, 6" silicone tubing: ID - 0.5mm (0.020"), OD - 0.95mm (0.037"). 25 gauge, 0.2mm sideport, 6" silicone tubing: ID - 0.3mm (0.012"), OD - 0.6mm (0.025"). 27 gauge, 0.2mm sideport, 6" silicone tubing: ID - 0.3mm (0.012"), OD - 0.6mm (0.025").